Every once in a while Mrs. Grilling24x7 comes up with a real winner that compliments my grilling perfectly. On the menu today was two simple NY strips, potatoes and a grilled veggie. But what about dessert? 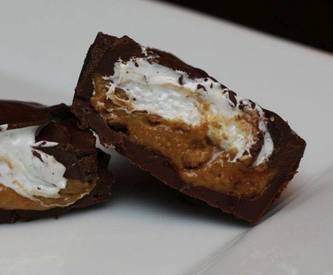 She came up with Fluffernutter Peanut Butter Cups. What an amazing treat! Take a look at this, it is the perfect party dessert as not only does it taste amazing but it is a fun conversation piece.